Do you smell it? Photos courtesy Warner Bros. Pictures. How can a 6’5, 262 behemoth be this adorable? Already universally beloved, it seems Dwayne Johnson somehow gets more and more popular with every movie he makes. 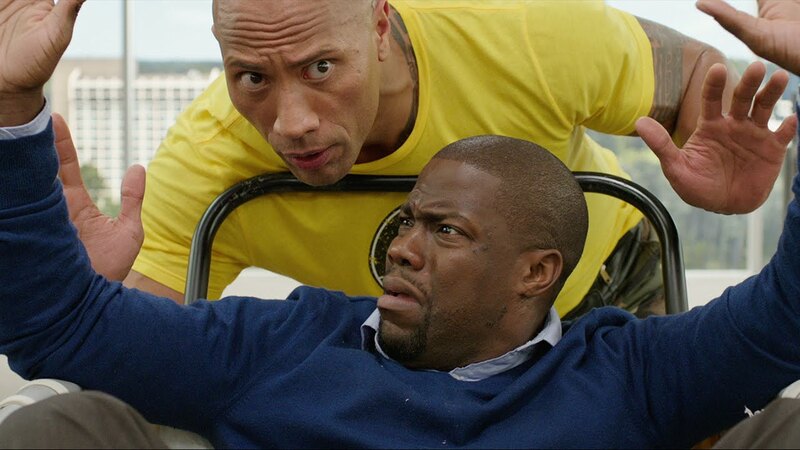 Though releasing to a modest $34.5 million against smash hit Finding Dory, Johnson’s and Kevin Hart’s mammoth built-in audiences will be making their ways to Central Intelligence this week and over the weekend, and they’re going to like what they see. The movie centers on Calvin Joyner (Hart), class president/prom king/starting quarterback/ruler of the high school universe, who is being presented with yet another award at the film’s start. Robbie Weirdicht (Johnson), then an obese, socially awkward loner, is taken from the shower and dumped naked into the gymnasium to the amusement of the entire class. Only Joyner has mercy, giving Weirdicht his letterman jacket to cover himself. Twenty years later, Joyner is at a dead-end accounting job and, despite having married his high school sweetheart, Maggie (Danielle Nicolet), who is herself a successful lawyer, is unhappy with his life. Suddenly, on the eve of their high school reunion, Weirdicht, now calling himself Bob Stone, crashes back into Joyner’s life. They get together apparently for old time’s sake, but Stone soon reveals that he works for the CIA and needs Joyner’s accounting skills to track down a sale of satellite codes that could cripple the U.S. in the wrong hands. Stone is himself viewed as a rogue agent and wanted by the CIA, and Joyner gets caught up in the action. Central Intelligence doesn’t come anywhere close to breaking new ground as a star-driven buddy comedy movie. The by-the-numbers plot is a bit of a turd, but it is polished to the point that you can see your face in it. Even though you can recognize the plot points as they come, everything that happens feels genuine. The scenes flow so beautifully into each other that every plot point makes sense from the movie’s unique perspective, not just from a robotic focus group perspective. Particularly well-done is the central mystery — it’s never completely clear whether Stone is a hero or a villain. The only thing that’s certain is he’s gone off the deep end, and that is sold indescribably well by Johnson. Johnson and Hart’s chemistry is somehow stunning, despite Johnson’s well-established chemistry with literally everyone he’s ever worked with. This is an actors’ movie, and as popular as the headliners are, it wouldn’t survive without its depth of talent. Amy Ryan plays Pamela Harris, the agent assigned with bringing Stone down, and there aren’t many better actors you could get for a third-billed role in a cheap summer comedy. Jason Bateman and Aaron Paul take tiny but pivotal parts that could have been reduced to cameos and raise them into the stratosphere with their subtlety and talent and give the movie even more popular appeal. Make absolutely no mistake, though — this is Johnson’s movie. In what may be his best performance yet, Johnson takes this paradoxical mess of a character and brings him to spectacular, completely believable life. He’s socially awkward in the extreme and brazen about it, the kind of person who genuinely can’t tell when he’s making people uncomfortable, but also goofy and affable in just as much of an extreme. He’s charismatic and approachable and intimidating and completely unhinged all at the same time. The character is written brilliantly, but no one could have played him like Johnson. Opposite him is Hart. I normally can’t stand his hectic overacting-as-humor, but in Joyner, he’s playing an everyman with untapped potential, and displays an as-yet unseen expertise. He can’t err on the side of going overboard in this role. He has to hit his notes precisely, and he does. Playing against Johnson, by far the best actor he’s ever worked with, no doubt helps. If San Andreas was the final proof of Johnson as a solo box office draw, Central Intelligence is the final proof of him as an entertainer. While Hart, Paul and Bateman were all great, he could have dragged them through their scenes together without slowing down. The movie is a confluence of expertly built scenes put together by hugely popular actors and a director, Rawson Marshall Thurber, smart enough to let them run. It comes highly recommended. This entry was posted in Entropy and tagged #aaron paul, #amy ryan, #arrested development, #Breaking Bad, #centralintelligence, #dwayne johnson, #jason bateman, #kevin hart, Central Intelligence, Do you smell what The Rock is cooking?, Dwayne Johnson is so adorable, The Rock. Bookmark the permalink.